Many people believe all their money problems will disappear once they start to make more money. I used to be one of those people. I had a very low income and I always wanted to earn more money because I thought it would make me happier. More money meant that I’d be able to do more of what I wanted to do. When my income did increase, I became more secure. But, I still didn’t feel any better about my finances because money was still tight. Instead of focusing solely on how much money I was earning, I took a look at what I was spending money on as well. That’s when I realized that lifestyle inflation played a huge role in deterring me from reaching financial success. Lifestyle inflation is when you spend more money after your income increases. In other words, you may tend to ‘treat yourself’ a little too much and inflate your lifestyle just because you’re making more money. For example, buying a new car when you get a better-paying job or raise could be seen as lifestyle inflation. 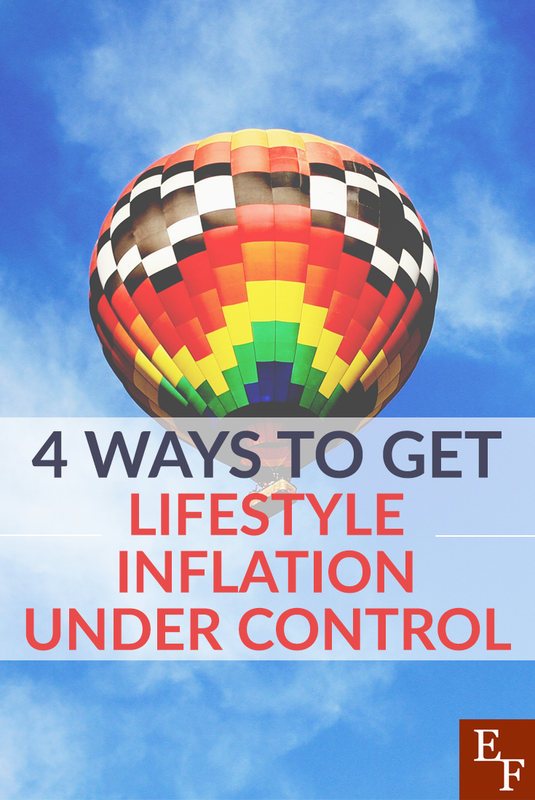 Lifestyle inflation a dangerous habit to get into because it can stop you from reaching your other financial goals. Luckily, there are quite a few ways to get it under control. The first step to overcoming lifestyle inflation is to admit you’ve fallen victim to the bad habit. Then, start tracking your spending so you can see exactly where all your money is going. Pull your bank and credit card statements to see exactly where your money has been going. Or you can use a free online tool like Personal Capital or Mint to help you keep track of your money. You may even want to full statements from the previous year if you can if your income is lower and compare the two to see which expenses have actually increased and why. If you find you’re unnecessarily inflating your lifestyle, you’ll be able to cut out some expenses once you actually realize what they are. In order to avoid lifestyle inflation and meet your most important financial goals, get into the habit of controlling your paycheck and taking care of your priorities first. Pay yourself first by setting up automatic transfers from your checking account to your savings account the day you get paid. Make debt payments early in the month so you don’t waste money on other unnecessary expenses. Then, spend whatever you have left affording to your budget. When you organize your finances this way, you’ll be less likely to overspend on things that aren’t truly important to you and lead a life of luxury. There’s nothing wrong with having fun with your money and splurging from time to time. However, it’s important to make sure setting yourself up for financial failure in the future. If you’ve found that you’re spending more money just because you’re making more, you may not have the money you need to invest, save, or pay off debt. Want to go on a nice vacation every year or send your kids to college one day? Lifestyle inflation is probably not your best bet then. Take some of your highest expenses and indulgences and see if you can reduce your out-of-pocket costs without giving up your favorite things. For example, if you enjoy shopping, head to the clearance rack or a thrift store twice a month instead to rack up on some new finds. If you love dining out and going to happy hour with friends, see if you can post a monthly potluck and game night at your house and use Groupons and other coupons and discounts to cut your restaurant bill. Maybe there’s a $0.20 wing night at one of your favorite bars you can check out some time. If you love going on weekend trips and exploring, try camping or even glamping instead to cut down on travel costs. You get the idea. Whatever the expense is, there’s probably a way to reduce the cost or reduce the money you spend in other areas of your budget. One of the best ways to avoid lifestyle inflation is to keep living how you’d been living before the extra money came in. If you know you receive a pay raise at work each year, continue to live as you were before you received the raise and save the extra money instead. If you start making some extra money on the side, you can put 100% of your earnings toward debt payoff or another financial goal and basically act as if the money is not a part of your total income. This is not hard to do as long as you’re comfortable with your current lifestyle and clear on your priorities. One of the best things I did to be able to pay off debt faster was continue to live like I was a ‘broke college student’. I could have upgraded my car, gotten a fancy new apartment with more amenities, or simply had more meals out at restaurants but instead, I chose to keep doing what felt natural and normal to me in order to get to the next level financially. At the end of the day, buying all the extra stuff wouldn’t have made me any more happier long term and you might be able to say the same. Lifestyle inflation is sneaky and can creep up at any time. If you feel that you’re suddenly spending a lot more just because you’re earning more, try doing these 4 things to get you back on track. Have you ever experienced lifestyle inflation?